When I first heard people talking about Pocketderm, ‘teledermatology’, and being able to talk to a dermatologist and get prescription medication online, I was a little skeptical. I’m old enough that I wasn’t sure exactly how much confidence I could put in a doctor that I never met or talked to, especially when it came to my skin, which is a fairly important part of my daily appearance. On the other hand, my father, who is over 60, still gets the occasional pimple (thanks for those genetics, Dad), and I am also very aware that most dermatology clinics are open during standard business hours – when I have to be at work myself – and that prescriptions, whether they are for acne or for anything else, are not always affordable. So I clicked on over to check Pocketderm out. Pocketderm’s front page isn’t what I would expect – there isn’t a “story” there, or a blurb about why I would want to try teledermatology rather than going to a regular clinic. What I found was simply text: “See a dermatologist online and get prescription medication at your door”, and two buttons: acne or anti-aging. Below that is a lot of social media content: Facebook posts, Instagram pictures, and links to forums on Reddit where Pocketderm is being discussed. I was a little confused about exactly which of the two options I should select; yes, I have occasional acne, but it’s not bad enough that I ever considered setting up an appointment with a brick-and-mortar dermatology clinic, and really, I’m hitting a point in my life where I would like to look youthful. So which to choose? There isn’t a bright-line guide up at the top of the page to help you out, but if you scroll all the way down to the bottom, past the social media posts and publication reviews, there’s a tiny link that says “Help me choose”. Frankly, I didn’t find that particularly helpful either, since it didn’t address my question – my acne isn’t what I would call significant, but it is there. So do I go with an acne treatment or an anti-aging treatment? Once you actually make a selection (and you’ll have an opportunity to change your mind later, so don’t worry too much about this first click), a new page will load that contains a little video that gives you a basic summary of the process. Since I’ll be covering all that here, watching the video is not particularly necessary. Underneath that is the “our story” section I was looking for earlier, with subheadings that provide you with little blurbs about how Pocketderm works (although again, none of this information is really in-depth). Scrolling down further brings me to blurbs about the use of prescription versus non-prescription skincare regimens, and a little bit about the Pocketderm treatment regimen, which I’ll cover more in depth later in this post. Then comes the important information: Pocketderm costs $19.95 per month. What the heck, I figured – they had a deal going on where my first month was free, and there is a 90 day money-back guarantee, so why not give it a shot? My skin is tough, so we’ll see how this process works. So I clicked on the “acne” button, because there is no such thing as a good pimple. Next, I was given a questionnaire, including the following: what was my skin type? (Oily.) How often do I get acne? (Maybe 1 pimple a week.) Have I ever used prescription anti-acne medication? (No.) Do I have any medication allergies? (No.) And the deal-breaker question: Am I pregnant? (No.) That last one is very important – pregnant people cannot use tretinoin in any form. Then they want pictures of your face. At least three of them, in fact: one of each side of your face, and one from the front. If you have issues in other places, or you want to attach extra close-up shots of problem areas (like the side of your nose, or your forehead), you are allowed to do that as well. You also get the opportunity to put in any comments or questions you have – so this is where I decided to ask if I should be using the Acne or Anti-aging program. I figured whoever ended up evaluating my skin would probably have a better answer after looking at my questionnaire and face than I could get from an internet flowchart. I completed my survey and sent in all my pictures and things late in the business day on December 30, 2014. On January 1, 2015, I had an e-mail response from the dermatologist assigned to me, Dr. Lortscher: Pocketderm Anti-Aging doesn’t treat acne at all, so if you have any concerns about acne you should use the acne program. He had prescribed me a custom-blended cream containing 4% azealic acid, 1% clindamycin, and 4% niacinimide. The next day, I got an e-mail that the cream had shipped from San Diego, and I had it shortly thereafter. 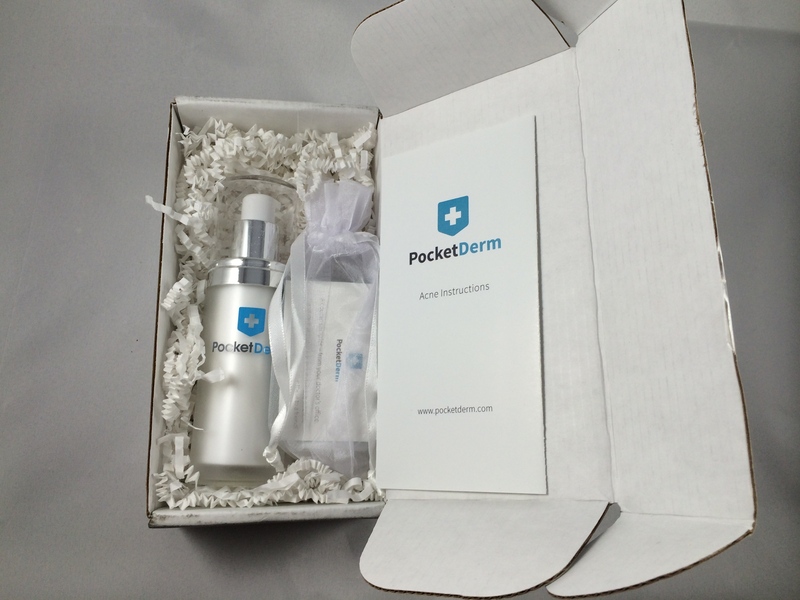 The Pocketderm cream comes in a small cardboard box, securely sealed and nicely packed to prevent damage. The bottle itself is frosted glass, which is helpful in case any of the ingredients degrade when exposed to sunlight, and is also airless, so the cream won’t dry up or go bad like it would if it was in a tub. Along with my first batch of Pocketderm, I also got samples of moisturizer and cleanser. There’s a label attached to the back of the bottle that lists the active ingredients in the cream – so if you need to let your GP know about other prescriptions and you’re worried you won’t be able to remember, you can just bring the bottle in and show them. My first day of use, I discontinued all of my other acid treatments, which at that point were COSRX’s BHA A-Sol and Mizon’s 8% AHA Peeling serum, and used just the Pocketderm prescription. This is what Pocketderm recommends because some people find the prescription to be sensitizing or drying; if you don’t find that to be the case you can always slowly add them back in after your skin has adjusted to your new routine. I thought the cream itself was fairly moisturizing, and had a faint sting in one or two areas that were already a little dry (thanks winter weather), but I didn’t really notice any irritation. The morning after, I didn’t see much of a change at all – although I was very happy to see I hadn’t turned bright red or ended up with really flaky skin! That night, when I put more Pocketderm on, the stinging sensation was completely gone. When I woke up the next morning, my skin did seem a little brighter. It seemed like everything was going really well! But then…. Day Five. Four or five small (but noticeable) little pimples on my face, and a bunch of clogged pores. That is not even a little the result I wanted from this process. This is the first message you’ll get from your dermatologist. I take shameless advantage of the ability to ask any question at any time. Hey, it’s my $20 a month, right? Might as well make use of it! Of course, without actually looking at my skin, there was really no way he could give me a concrete answer, and I hadn’t attached any pictures. So he simply asked me to wait a week, and then upload a lot of photos so he could take a look and check on my skin’s condition. Luckily for me, by the time I got this response, my skin had basically cleared. Most of my acne was gone, and there was very little post-inflammatory hyper pigmentation left as well. In fact, I’d had a rather large bump under my skin on my chin for several months despite some fairly drastic actions on my part (don’t be dumb like me, guys, refrain from picking at your skin), and by the eighth day of Pocketderm treatment it had almost completely disappeared. Around this time, I had pre-scheduled an appointment at my salon for a facial and brow wax. Since I wasn’t sure exactly how the Pocketderm prescription would interact with the products my aesthetician uses during a facial, I cancelled that appointment – but I kept the one for a brow wax. I went in and spoke with my aesthetician, and let her know that I’d started a new skin prescription. She told me that generally as long as I don’t feel my skin is more sensitive than usual there shouldn’t be a problem, but that she would start off really slow and gentle and I should stop her any time I felt discomfort. At this point my medication didn’t contain tretinoin, so I decided it was worth a shot. Maybe I’m braver than I should be. The waxing process itself wasn’t any more painful than it usually is, but I did notice that my skin got a lot redder, a little puffier, and it stung for a while after the waxing was done. This leads me to believe that my skin was a little more sensitive – not a lot, but enough that I made a mental note to stop applying the cream around my eyebrows a day before my next waxing appointment. Things went on basically the same way for the next two weeks – no pimples, no acne at all really once the initial purge calmed down – and then it was the time I was most curious about: my usual hormonal breakout time of the month. Generally, around this time, I end up with a couple of small cysts around the sides of both nostrils; they don’t hurt as long as they’re small, they pop easily, and there isn’t a plug of any kind in them, but they’re super frustrating and they look gross. I was hoping that, since I was on Pocketderm, I wouldn’t have to deal with any of these nasty little things, and would be able to go about my day feeling less self-conscious. Luckily for me, it did work. I ended up not getting a single little zit, which I consider to be a minor miracle. However, towards the end of February, I did notice that I was getting a couple of new acne spots, and my sebaceous filaments (those dark spots in the pores on your nose) were becoming visible again, as if I wasn’t using Pocketderm at all anymore. Lucky for me, right after I started to get concerned I got a reminder e-mail that it was time for another consultation. And then, to top it all off, my cream ran out (clearly I wasn’t monitoring it closely enough or I would have known to reorder). I uploaded new pictures and got a response, again, within a day or two – this time with a new prescription: the same 1% clindamycin, 8% azealic acid, and the addition of 0.018% tretinoin. We’ll have to see how this new prescription works out! I’ve done a lot of positive talking about this product and this service, but I do want to say a few other things. I like Dr. Loertscher, and I liked the first prescription he provided me with, but that isn’t going to stop me from making an appointment with a brick-and-mortar dermatology office later this month. While doctors are, in my experience, loath to criticize each other, I’m sure that if something is really wrong with the way this new cream is reacting with my skin the dermatologist will say something. I should be going in yearly for mole checks anyway since my grandmother had skin cancer at least once, but I haven’t gotten around to it yet. It’s also interesting to me that, as far as I know, there are actually only two dermatologists that are associated with Pocketderm – Dr. Lortscher and Dr. Satur. 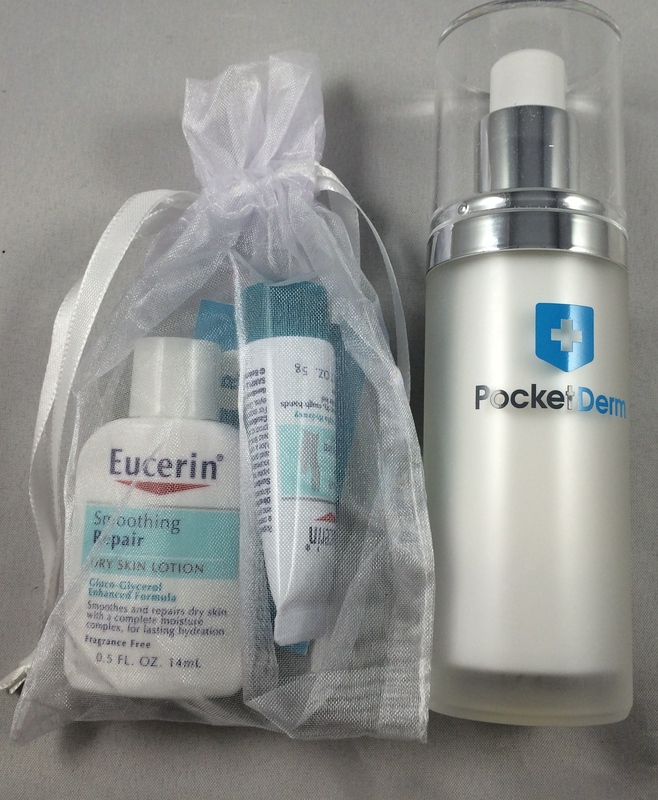 Pocketderm is available in quite a few states – 37 if I remember correctly – and they are looking to expand the practice. If they intend to keep wait times reasonable while still providing sound medical advice and adequate study of each person’s pictures and questionnaires, plus dealing with new questions that come in and continuing to manufacture custom-blended prescriptions, I imagine that they’re going to have to add more staff – and frankly I’d be happy if my teledermatologist was in my actual state, so they could use their personal knowledge to take the effects of climate and weather into account when I ask them questions. One other thing, which is really more of an annoyance: prepare for quite a few e-mails from Pocketderm in the first month. My first month with Pocketderm I got nine e-mails, and I continue to get them. Some of them are pure marketing – sign up your friends and get a referral discount! – but the rest are either notifications of messages from your dermatologist, reminder notices about upcoming consultations, or random things that I found totally irrelevant like how to use an airless bottle (hello, there’s an instruction booklet included in the box with it) or “reminders and tips”. These messages will drastically decrease after the first month and a half or so, though, so you can just delete and wait them out. 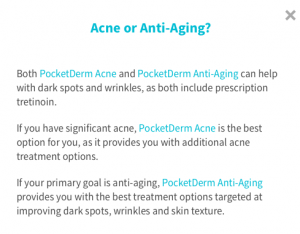 Pocketderm is an easy way to obtain a prescription cream that is tailored to your skin type and your concerns, whether that is getting rid of acne or slowing down the aging process. It’s fairly simple to set up, although you don’t get a lot of the good information until you do unless you hunt through the FAQ on the site or read about the perks elsewhere. 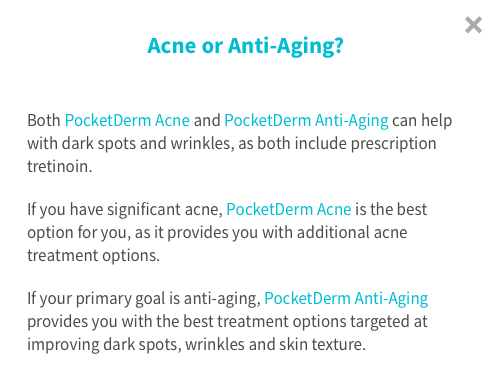 If you’re concerned about your skin and want to try out prescription medication, but you don’t have the time or money to go to an in-office dermatologist and pay for prescriptions separately, you might want to give Pocketderm a shot. Your $20 per month covers a lot – your prescription cream (with refills as often as you need them at no extra charge), as many consultations with your dermatologist as you want, and if it’s medically necessary a prescription for antibiotics that you can fill at your local pharmacy (although the pills themselves will cost extra – you’ll have to pay out of pocket or use your insurance there). The down side is, of course, that they can’t see your skin – all they know is the information that you give them, so if you leave something out (or don’t know something is going on and therefore don’t tell them) they might be missing some important information that could help them decide what medications to prescribe. So, what do you think? Will you give Pocketderm a shot, go to a regular dermatologist, or use over the counter products? This entry was posted in dermatology, medicine, online services, Pocketderm, treatment and tagged In-depth, multi-part, Pocketderm by BeautyVersusZombies. Bookmark the permalink.